Indianapolis’s Irvington neighborhood, located five miles east of downtown, is a well-established community. The quaint homes lining its streets have stood for decades. 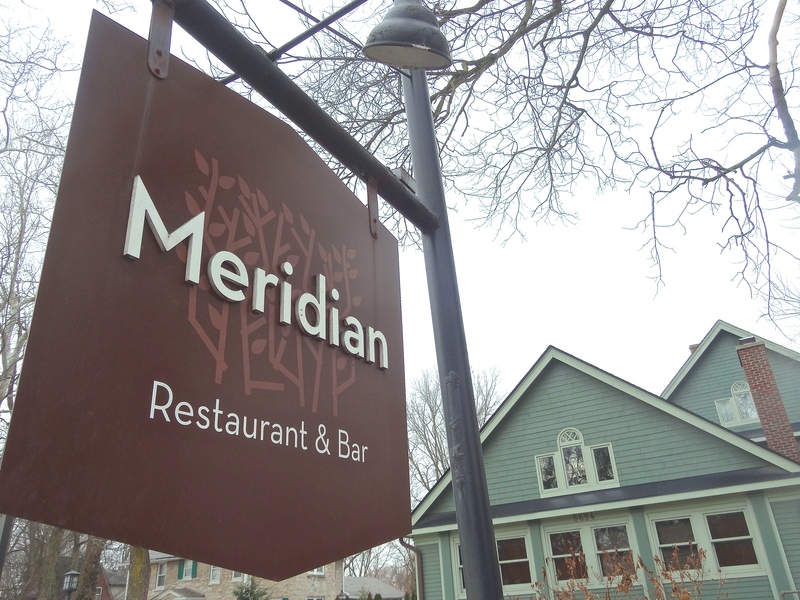 Neighbors share conversation over breakfast at local eateries like The Legend. 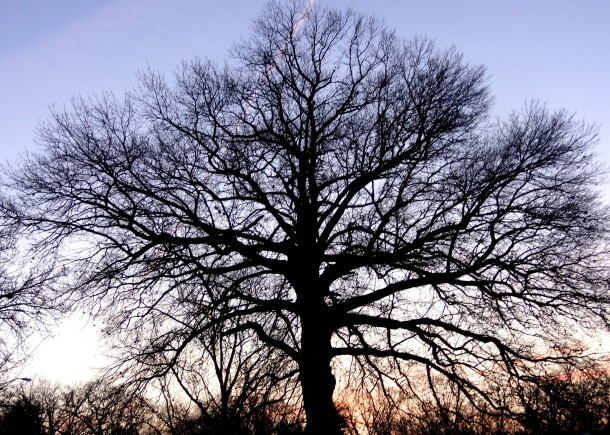 It is home to Indiana’s oldest tree, the Kile Oak, a burr oak estimated to be between 300-400 years old. So it’s no surprise that Ellenberger Park, located on the north side of Irvington, is a community destination steeped in history and tradition. 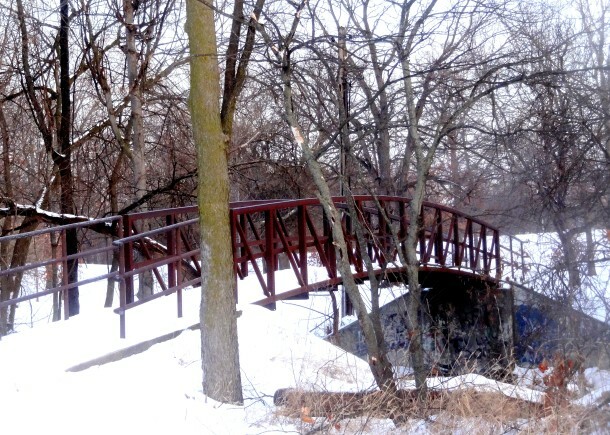 Ellenberger Park is a 42-acre stretch of land located at 5301 East St. Clair Street. It features two playgrounds, sand volleyball and tennis courts, baseball, softball, and football fields, and the Ellenberger Park Pool. The park hosts the popular Irvington Farmers Market on select Sundays during the spring through early fall months, featuring over 70 local vendors. On warm summer nights, patrons gather on picnic blankets to listen to live music and watch movies as part of the Indy Parks Concerts & Movies series. Aside from the playgrounds and sports facilities, the park remains largely untouched. Its southern border is formed by Pleasant Run creek. Evergreen, sycamore, and oak trees tower over the landscape. The rolling hills of Ellenberger Park make it a popular sledding destination in winter. It turns out that the primitive design of Ellenberger Park was no accident. The land was originally owned by the Sandusky family as part of their sprawling 320-acre farm. John Ellenberger began tenant farming on the land in 1853. By 1865 he had purchased his own 160-acre plot from the Sanduskys and built a farmhouse near what would be 10th Street today. Ellenberger was a generous community member and in 1882 began allowing families in the Irvington area to use the woods as an informal recreation site. A map of Irvington. Ellenberger Park is on the north side of the map. 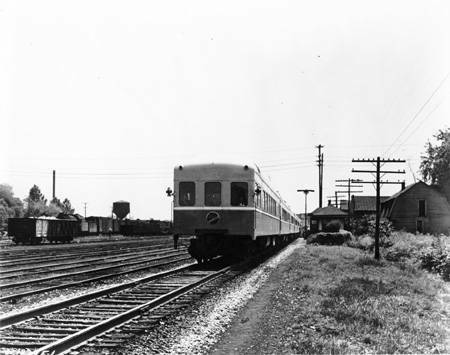 At the turn of the 20th century, Indianapolis’s population was increasing rapidly, approaching 200,000 total residents. The demand for public services, including parks, was growing. The city purchased 32 acres of Ellenberger’s wooded property in 1909. The money was raised through a tax levied on eastside residents. The community initially balked at the tax hike; after all, they argued, they had been using the area as a park for over 25 years. Despite the protest, the tax increase went into effect and the city bought the property for $500 per acre. Additional purchases of adjoining acreage made in 1911 and 1915 brought the park’s total area up to its present size. 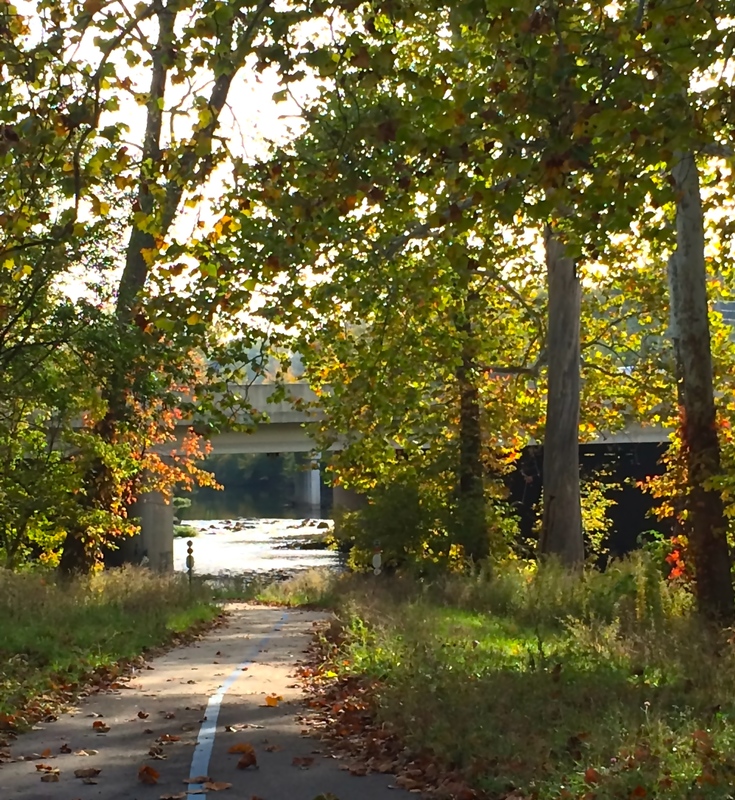 In 1908 the city of Indianapolis hired famed urban planner and landscape architect George Edward Kessler to develop the area as part of a citywide park system. He had previously designed impressive parks for St. Louis, Cincinnati, and Kansas City. Eager to compete with these other up-and-coming cities, Indianapolis sought Kessler’s expertise. He spent a year studying the city and took into consideration the public’s desire to have smaller, regional parks that served individual neighborhoods. 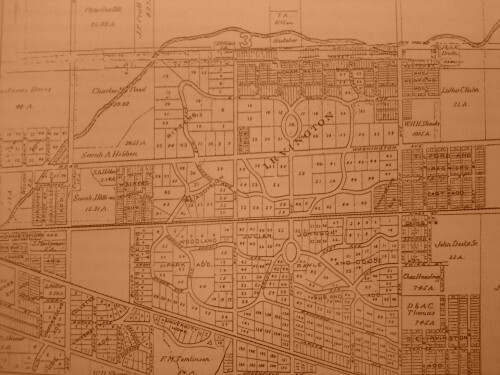 His Park and Boulevard Plan included parks in every major area of town connected by parkways. Kessler’s design was not only beautiful, but also practical. It allowed for thoughtful urban growth, prevented erosion and water pollution, and provided flood control. The layout was set on a diagonal, providing a contrast to the strict grid system utilized in residential areas. Ellenberger Park experienced a brief identity crisis in the 1920’s. 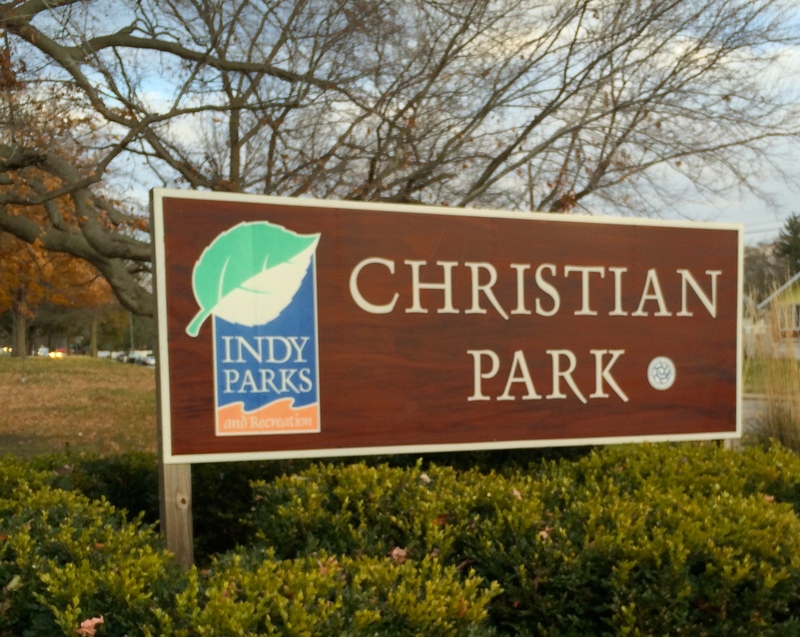 The Board of Parks (now Indy Parks) voted to rename it in 1922, to honor Dr. Henry Jameson, who served as chairman of the Board during the planning and construction phases of the successful Kessler Park System. Irvington residents protested the change, wanting to maintain the Ellenberger family’s legacy. This time their objections were heard; the name was changed back to Ellenberger Park in 1926. 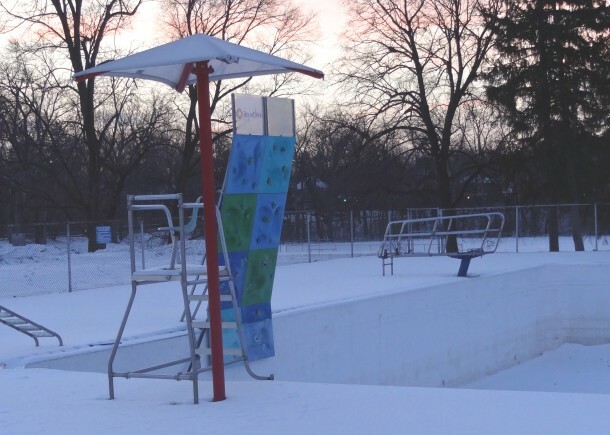 In 1927 the Board of Parks began construction of the Ellenberger Park pool on the north side of the park, completing the project in 1930. It went through an extensive rehabilitation in 1974 and the pool house and changing area were added. The Ellenberger Park Ice Rink was installed as an outdoor skating facility in 1962. The rink was enclosed during renovation of the pool. This precious community asset is in need of further improvements. It lacks covered picnic areas and public restroom facilities. The once-popular ice rink closed in 2009 when improvements were deemed too costly. Signs along Pleasant Run creek warn visitors not to swim in its waters due to potential sewage runoff. There is no spectator seating around the baseball diamonds and football fields. Yet signs of community involvement remain. 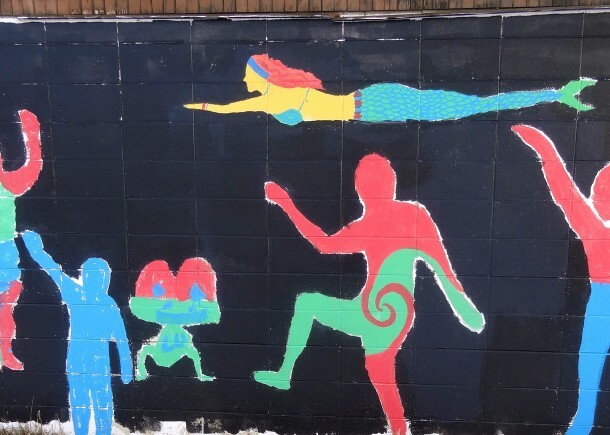 A mural dated 2009 graces the back of the pool house and is signed by children participating in Indy Park’s summer programs. 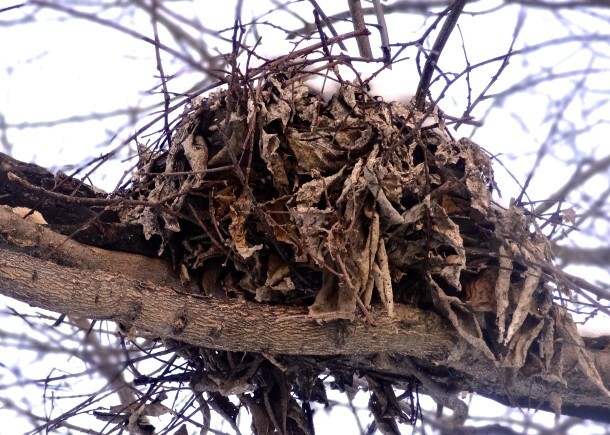 Birdhouses placed around the park attract nesting birds. Neighbors wave at each other as they jog along the wooded trails. 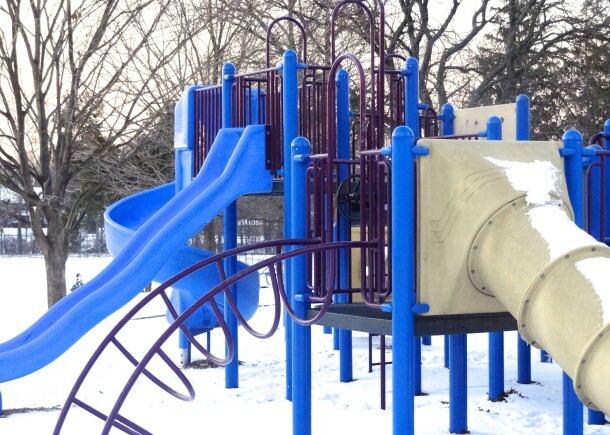 In the 1980’s, Indy Parks proposed a renovated parking area but neighbors fought the expansion because the plans eliminated the park’s beloved sledding hill. 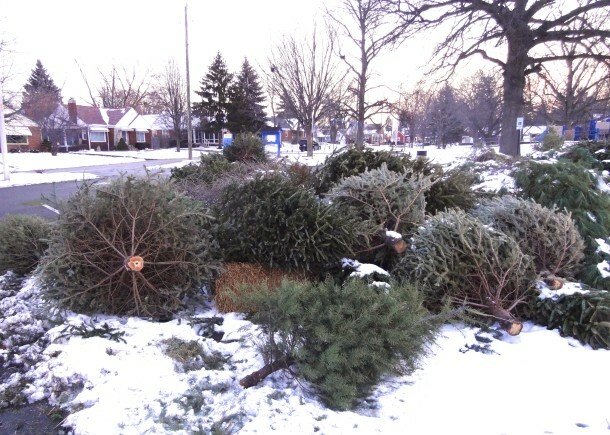 Local residents dropped off their Christmas Trees at the Ellenberger Park park lot in January. Indy Parks will reuse the trees to create habitats for fish in lakes and ponds at various city parks. 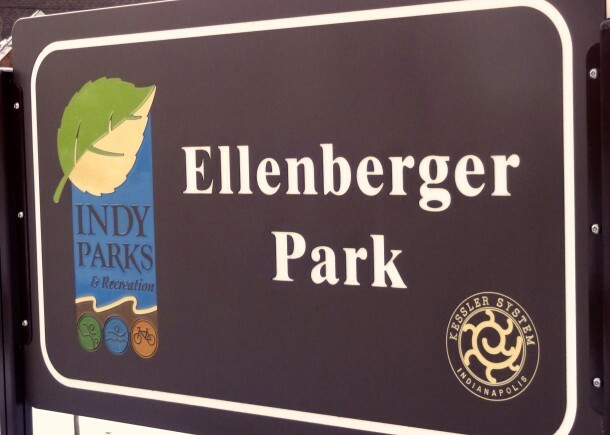 Ellenberger Park is, above all, a place where families and friends gather for socialization, exercise, and spirited competition. It is an oasis of unspoiled nature in the midst of a tightly-knit residential area. Continued engagement from neighbors can help ensure that Ellenberger Park and the City’s other parks remain places for rest and recreation for many pairs of younger feet in years to come. Thank you for this very informative article! When my husband & I were first married, we lived in the 5100 block of East North Street, just 2 blocks from Ellenberger Park. 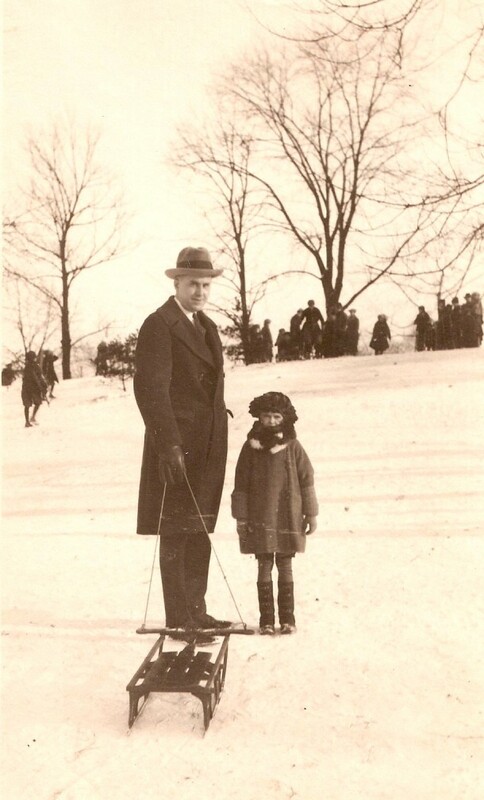 In the winter we would walk down to the park and ice skate at the rink – lots of very happy memories! Not many people are aware that Ellenberger housed a 9-hole golf course (that was poised to expand to 18 holes) from about 1913-1920. Typically called the Irvington Links or the Irvington Golf Course, it was leased by the city from the Ellenberger family until the parties couldn’t agree on a price and the course was shuttered. Pleasant Run Golf Course opened soon after in 1922. While the layout of the course remains a mystery, I’ve gleaned a reasonable idea of the first four holes and have even found a breakdown of each hole’s length and par including a 225 yard par-3 and finishing on a 508 yard par-5. The course covered 2,847 yards for a par 34 (in comparison, the front 9 at Pleasant Run is 2,777 yards from the white tees, par 36). The sports pages of the Star and News both covered local tournaments and play at the city courses, and Irvington was no exception. Any perusal of the paper during those years will turn up plenty of mentions. I’ve got a small collection of articles if anyone is interested to contact me. And for all the golfers out there, may you shoot your age before you die. Thank you Jason! This is wonderful information. Best of luck on the links. Thanks for a GREAT article and the opportunity to reminisce!!! This was our “neighborhood” park where we all went to play, the kids of School 62 and School 58, and where our church, Linwood Christian Church, had all of its picnics. It also contained “our” swimming pool. I remember walking to the park with my Mom and 2 sisters to go sledding. And I remember the thrill of riding my bike down the big hill near the swimming pool. I remember walking with my classmates from school 62 for end of the year picnics. I remember my Dad came home early from work and took us swimming at the pool. Ellenberger has lots of nice memories, too many to count. I worked the concession stand in 1954, and was a life guard here in 1955. All the kids living on St. Clair, Hawthorn, and 9th played baseball on the NW corner of the park. Trees? Yes but we just played around them. Some of us can remember when there were two concrete islands in the Ellenberger pool. One day in 1952 I road my bike down the Michigan St creek bank at Ritter and flipped over head first into the creek – lucky I didn’t break my neck. Great article, Gwen. Thank you for sharing your research with us. I have a question for you regarding the H.F. Presnall painting. 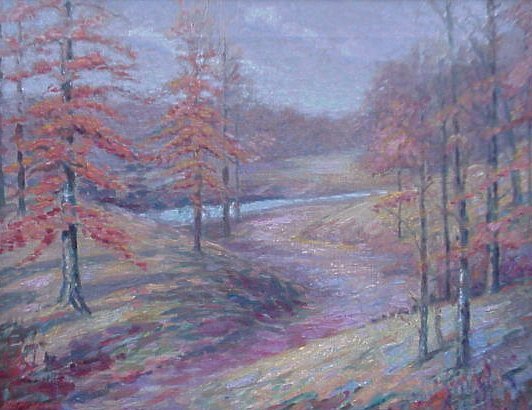 Do you have any information about where exactly in the park that scene is, or details about the artist? Just curious. Again, I very much enjoyed your writing. Your article was the only place I could find info that said the ice rink is closed. Even the Indy Parks website doesn’t say this. Other recreation helper websites list it as still open, even though you say it closed 6 years ago! Thanks for the info. The only thing I want to point out is that I think you mis-identified one of your photos. 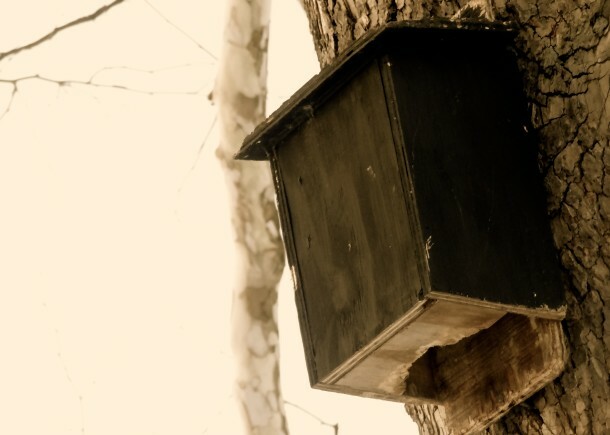 You have a pic of a black box on a tree, and called it a bird house. I could be wrong, but I’m pretty sure that’s a BAT house. 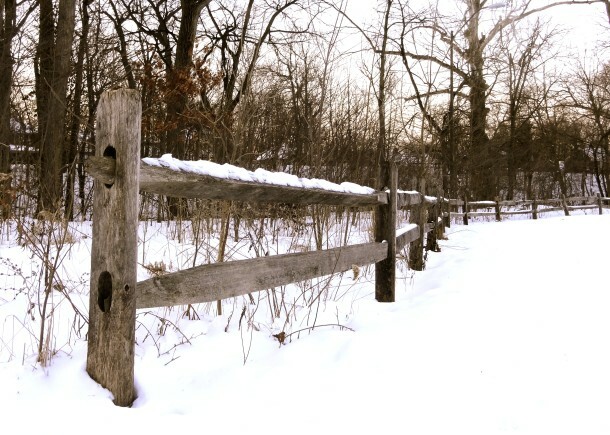 Swam all summer… Sledded all winter at Ellenberger growing up. Sooo many childhood memories. I don’t live anywhere near here yet I still come back in the warmer months to pause and reminisce of the ‘SPECIAL” days. So thank you. Why does the park manager let the Farmers market drive all over the grass and under the trees ? It really needs to be used properly. Market should be near an access road so they can unload and load cars so over 100 cars drive over natural areas. Does anyone remember a shed in Ellenberger Park that would have been there in 1950? I would love to see a photo of it. I have a painting by Clifton Wheeler titled “Tool Shed in Ellenberger Park” and it is dated 1950 and I am trying to locate exactly where it was painted. Try to look at the aerial maps on maps.indy.gov/MapIndy , they go back to 1937. You might be able to figure it out using that. As Carmel and Noblesville prepare to open “open air” skating rinks, couldn’t Indy Parks at least investigate the possibility of replacing the one at Ellenberger? Possibly over the past years there have been innovations in creating and maintaining ice for skating. I’m sure I’m just daydreaming, but wouldn’t it be nice? I remember being part of the Ellenberger’s swimming and diving teams. Oh the fun I had when I was living in Irvington. I’ve moved away from the area but the days spent there were priceless. It was a great park in which to grow up and watch the animals live.